MPP Sophie Kiwala and a COGECO film crew was in the School's Perk Lab on August 10, to shoot an episode for the TV series "Conversations with Sophie". Quoting Ms. Kiwala, this is "a show featuring some of Kingston's most inspiring people." The film concentrates on NaviKnife, a collaborative project between the School of Computing's Perk Lab and the Department of Surgery. 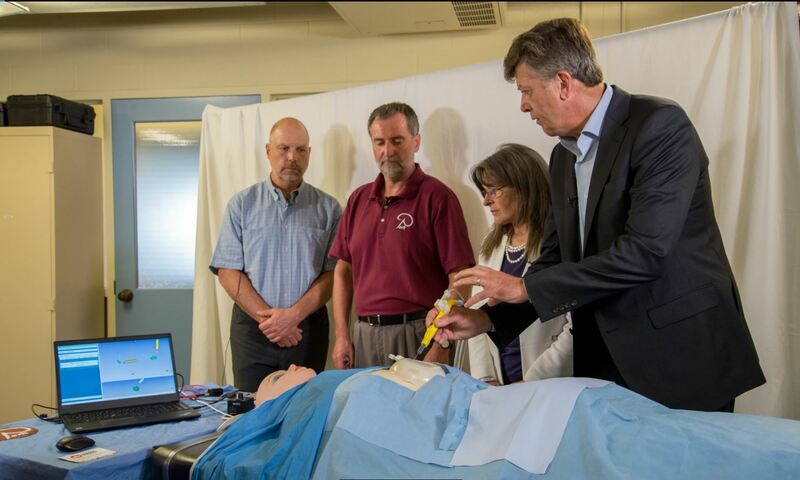 NaviKnife is a novel surgical navigation technology, invented, patented and clinically tested at Queen's. Much like a miniature GPS device, NaviKnife allows surgeons to visualize breast tumors and the position of the surgical tool in real-time with the use of electromagnetic position tracking. NaviKnife aims to eliminate surgical failures due to incomplete resection of the tumor while also reducing the amount of breast tissue resected thus enhancing cosmetic outcome and eliminating the need for breast reconstruction surgery. The film features a hands-on demo of NaviKnife and interviews with some of its principal developers, Drs. Gabor Fichtinger, Andras Lasso and Tamas Ungi of the School of Computing and Drs. John Rudan and C. Jay Engel of the Department of Surgery. The film is expected to air in early October; broadcasting details will follow.